"Beautiful gun, this one. I've got lots of guns. Then again, I'm a collector and never use them on people, unless they ask for it. Guns really are like works of art and should be kept on the wall or in the hands of sensible people who know how to handle them, like contract killers." 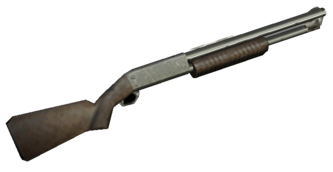 The Pump Action Shotgun is one of the many shotguns available throughout the Grand Theft Auto series of games. 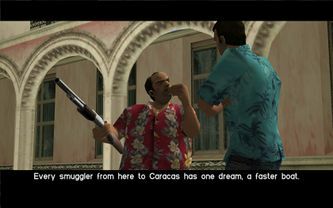 Ricardo Diaz wielding a shotgun in Grand Theft Auto: Vice City. The Pump Action Shotgun in GTA Vice City. 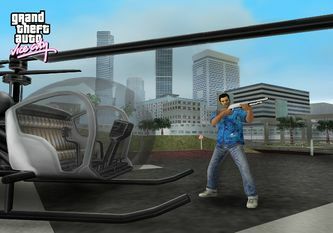 Tommy Vercetti wielding a Pump-Action Shotgun in a pre-release screenshot of GTA Vice City. A unique quality attributed to the shotgun is that is fires several projectiles at once, and at close range two accurate spreads will destroy most non-bulletproof vehicles. The shotgun pellets can also knock down enemies. Another advantage is that it can be purchased at most Ammu-Nation stores for a cheap price, or found in police cars, making it one of the more powerful yet inexpensive weapons. A large disadvantage with this shotgun is that the player cannot run with it (minus in GTA Liberty City Stories, GTA Vice City Stories, GTA IV, and GTA V). The pump mechanism has a very slow rate of fire, so it cannot be used effectively against multiple enemies in different directions. Lastly, it is easily outranged by the rifles. In Grand Theft Auto III, the shotgun's in-game model is a Remington 870 Police Magnum with a handle grip and a foldable stock in the retracted position. While obscured in game in GTA Advance, the shotgun icon for GTA III was reused for Advance, implying the shotgun in GTA Advance is similar to that of GTA III. For GTA Vice City (where it is internally known as the "Chrome Shotgun") and San Andreas, it resembles an Ithaca 37 with a fixed wooden buttstock. For GTA Liberty City Stories and GTA Vice City Stories, it is a Browning 0/U shotgun, although it incorrecly functions like a pump shotgun when it is a break open shotgun in real life (meaning it can only hold two shells at a time). In Grand Theft Auto IV, it is an Ithaca 37 Stakeout but it has a side-mounted ejection port instead of the Ithaca's underside loading/ejection port, and it doesn't have a loading port at all, has a short barrel, and magazine tube with a pistol grip similar in design to the Stubby Shotgun due to it being based on an airsoft version of the Ithaca 37. The shotgun holds eight shells, however the length of the barrel and magazine tube should only hold four. In Grand Theft Auto: Chinatown Wars it resembles a Remington 870 that has its stock removed and barrel shortened. It goes back to its pre GTA IV function as being reloaded after each pump though like GTA IV it can be found in police cars and be purchased from Ammu-Nation. Police cars usually have a shotgun with five rounds in them, which is added to the player's arsenal once they exit the vehicle. The cars parked at police stations may or may not be locked. Also the player can block a patrolling police car, attempt to unlock it, and then enter the vehicle one the cop exits to chase the player down and arrest him. Saint Mark's, Portland - On top of one of the car garages on the block north of Momma's Restaurante. You have to go through the rooftop park across the street west of Salvatore Leone's Mansion to gain access. Saint Mark's, Portland - The Leone Family gang carry this weapon for the rest of the game, after the mission Sayonara Salvatore. This makes subsequent visits to this area especially dangerous, as the player's unarmored vehicle can succumb to a few shotgun blasts (usually 2), while on foot the player can be knocked down by shotgun pellets and then swarmed. Hepburn Heights, Portland - On the northwest side of the eastern tall apartment building. Rockford, Staunton Island - Available to buy from Phil Cassidy's Army Surplus after completion of Arms Shortage ($1,500). Belleville Park, Staunton Island - Behind the obelisk on the east side of the main park. Bedford Point, Staunton Island - North of the pier west of Liberty Tree Offices. Cochrane Dam, Shoreside Vale - At the base of the Cochrane Dam power house, near the road loop, on a metal ledge on the east side. Washington Beach - Behind one of the benches on the sidewalk by the beach south of Standing Vice Point. Ocean Beach - On the top parking level (southeast side) of the Washington Mall. Ocean Beach - Available to buy from Ammu-Nation after completion of Mall Shootout ($500). Starfish Island - In the small room at the bottom of the Vercetti Estate's stairwell, east of the main entrance after completion of Rub Out. Doherty, San Fierro - Around the premises of Solarin Industries. Valle Ocultado, Bone County - On the jetty. Fort Carson, Bone County - In front of a house southwest of the town. Roca Escalante, Las Venturas - Inside the Las Venturas Police Headquarters (instant 2-star wanted level except if collected while holding a melee weapon). Pilson Intersection, Las Venturas - Under the easternmost arc of the intersection (the one that starts at Julius Thruway West which leads to Bone County). If you photograph all fifty snapshots in San Fierro, the shotgun will be rewarded to you. It can be found beside the garage. During the first mission with Ryder as your boss, instead of going straight to the car, you can first punch out the clerk and steal his shotgun with 7 shotgun shells. Harwood, Portland - Spawns on a pier near the ferry station. Bedford Point, Staunton Island - In an alleyway behind the LCFR headquarters. Bedford Point, Staunton Island - Can be bought from Phil Cassidy's Fully Cocked Gun Shop once the player passes Friggin' the Riggin' ($1,500). Spawns at each of the player's safehouses after collecting twenty Hidden Packages. Little Haiti - Spawns on a roof across Le Singe d'Arbre. Downtown - Available to buy from Ammu-Nation for $1,000 but the price is decreased to $750 (25% off) after the player beats Phil's Shooting Range. The Pump Shotgun can be purchased from the back-alley gun shops for $1200, and each additional magazine is worth $100. The Pump Shotgun is not available from Little Jacob. The LCPD, NOOSE, and FIB, in addition, use this gun as a secondary weapon. It can be picked up from them when they are killed. This gun, rarely used on multiplayer but extensively used on single player, is extremely powerful. It will kill any single player foes with one shot (even fully healthy and fully armored ones at point blank), and the most needed for multiplayer will be about 3 or 4 leg shots. This is a 1 hit kill at close range on any part of the body. It can't be fired from vehicles. Meadows Park - Can be found on the second decrepit pier to the right of Sing Sing Ave / Dukes Bay Bridge, over the water. Francis International Airport - Can be found next to a support column for the Broker-Dukes Expressway on-ramp. The support column is the first one the player sees on the right, from the airport entrance. Northern Gardens - Can be found over the cliff on the north side of Grand Boulevard. The shotgun is lying next to a large bush. Middle Park - Can be found on the C/B platform of the C/K Algonquin Inner Line at North Park Station. Varsity Heights - Can be found by two truck trailers in a construction equipment storage depot, to the right of Union Drive West. The shotgun is laying on the dividing wall. Alderney City - Can be found in the vacant lot behind AutoErotiCar. GTA Vice City, and GTA San Andreas. Mike with a pump action shotgun. Toni Cipriani with a pump action shotgun in GTA Liberty City Stories. Niko Bellic wielding a pump-action shotgun in GTA IV. GTA Vice City (mobile version). This is essentially a blue-and-pink recolor of the GTA III icon. GTA Vice City (mobile version). This is the unused HUD icon that would have been used for the shotgun, considering its PC/console version HUD icon. HUD for GTA SA, GTA LCS, and GTA VCS. A Remington 870 Police Magnum with its stock folded seen in GTA III and (possibly) in GTA Advance. The Ithaca 37 featured in GTA Vice City and GTA San Andreas. The Browning 0/U which is in GTA Liberty City Stories and GTA Vice City Stories. Airsoft Ithaca 37 "Stakeout" replica, identical to the one used in the GTA IV era. And a real Ithaca 37 "Stakeout" for comparison. Can be picked up from them when the LCPD, NOOSE, and FIB are killed. Not be used effectively against multiple enemies in different directions. It is easily outranged by other weapons in the game. The GTA IV rendition of the shotgun bears a "Model No. 69" etching (alongside another reading " ~ 12.GAUGE ~") on the magazine tube. The Shotgun in GTA III is equivalent to the Stubby Shotgun in later GTA games, evidence is that, the Shotgun shoots five shells, it has a one shot kill, and can destroy a car in two shoots at close range, which makes the GTA III shotgun and the Stubby Shotgun almost the same in terms of gun power. They also feature a similar firing animation. The Stubby Shotgun actually deals more damage than the GTA III rendition of the Shotgun (120 vs 100). The Shotgun in GTA San Andreas ejects its shell before CJ pumps the shotgun. This is incorrect because the shell should be ejected along with the pump. Before reaching "Gangster" in pump shotgun wielding, CJ fires the gun without utilizing the stock. In GTA IV, no matter how many time you fire before reloading, you will always put in two shells before pumping. In the iOS and Android versions of GTA Vice City, the Shotgun reuses the GTA III Shotgun's weapon icon, albeit recolored blue and pink (internally named "hud_shotgun"). However, a new, remastered icon, named "hud_chromedshotgun", can still be found in the data. The new icon can be used by swapping the two icons' names around. This page was last modified on 30 June 2015, at 03:47.